Growing up in the 1930s, Ian Lankshear planned to join the family business, which was one of Wellington’s leading printers. Then World War II intervened. Like many others, Ian’s life changed course. He went to the United Kingdom to serve in the Royal New Zealand Air Force, flying Beaufighters as a flight sergeant. At the end of the war, Ian and his wife, previously Jean Dalglish Wallace, who had also served her country in the New Zealand Women’s Auxiliary Air Force in Wellington, decided city life and the family business were not for them. They wanted to go farming. After first moving onto a small Katikati dairy farm, they secured a loan from the Rural Bank in Hamilton, where Jean’s brother, Robyn Wallace, was a manager, and where the couple’s war service played in their favour. With that extra assistance, in 1948, they took up 60 hectares at Pahoia on Tauranga Harbour’s foreshore. Bruce Lankshear is one of the couple’s eight children. He remembers growing up on the farm. “We experienced a subsistence environment in a lush oasis of natural beauty, where the productivity of the land meant we never went short. Everything we ate came off the property. We had meat from the farm, fish from the sea, vegetables from the garden and fruit from the orchard. Although we were a big family, the land was productive enough to provide for all of us,” he said. As well as meeting their own needs, the farm ran a herd of 110 dairy cows, supplying milk to the Kaimai Dairy Cooperative, based in Tauranga. Eighteen kilometres west of Tauranga, dairy was the predominant local land use through the 50s and 60s, and the Lankshear family was one of around 10 on the Pahoia Peninsula milking cows. That started to change in the 1970s, as Bruce explains. “First, some farms transitioned into drystock, then, because of the changes in subdivision rules that came to Pahoia, horticulture took off and land values increased. “Those changes transformed Pahoia, which went from open land to segmented spaces, defined by shelter-belts. Where, previously, there were 10 dairy farms with 10 homes and families, today there are 120 homes along the peninsula, with most of the density down at the waterfront. This has created a new community of people enjoying a special lifestyle,” he said. Ian and Jean embraced the changes, participating fully in the new community for many years, including Ian serving two terms as a local councillor. Meanwhile, they subdivided the farm bit by bit, gradually selling land for conversion to horticulture, including some to their children, who could not bear to leave. However, the couple held on to the most favoured five hectare parcel for themselves, right on the waterfront. They named the remaining homestead property Auchenbrain, after a farm in Scotland with ties to the Wallace clan through Jean’s father, Robert Drummond Wallace. After Jean died in 2006, Ian stayed on, continuing to enjoy the land, the spectacular views, his family and the community. In March 2017, looking out on Tauranga Harbour from his home, he died, aged 95. 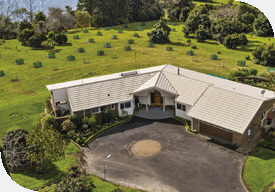 After 70 years in the Lankshear family, Bruce and his siblings decided to sell Auchenbrain, engaging Andrew Fowler of PGG Wrightson Real Estate, Tauranga, to assist. Andrew describes it as a hidden haven sloping gently to the water. “Although a broad waterfront ribbon on 200 metres along the sandy Tauranga Harbour foreshore with plenty of recreation opportunities is an outstanding feature, the spectacular views surpass even that: a sweeping panorama, embracing Matakana Island and sunset glory over the Kaimais, Bowentown Heads and Coromandel in between. “Auchenbrain orchard comprises citrus and over 150 avocados, alongside a secret forest path down to the harbour, and another scenic walk to a hidden pond, with birdlife including kaka, tui and kereru. “It is a glamorous home on a spectacular property, with enormous potential,” he said. For more information, see page 40 of our latest publication, The Lifestyle Collection.